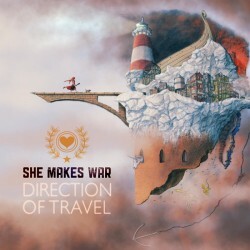 She Makes War’s third album “Direction Of Travel” is out now via The state51 Conspiracy. The album is available to buy direct from Bandcamp (CD and download), iTunes and all other good online stores. Massive thanks to everyone for their support with this release! Grungey, tuneful, fragile, bitter, and brilliant…She Makes War has delivered one of the most fulfilling experiences of 2016 so far. 8/10 ~Max Mazonowicz, The Digital Fix. The grand songs, like single Drown Me Out, are more imposing; the simple songs, like Paper Thin (an early favourite to win my Song of 2016) are more unassuming, and more stunning as a result. It’s gloomier (In Cold Blood), it’s poppier (Cold Shoulder). It’s incredibly musically innovative. 5/5 ~ Nina Keen, NARC Magazine. Vocal playfulness reminiscent of PJ Harvey is layered beneath molasses melodies and grunge-grit…Direction of Travel is heavier on gloom that it is on pop, but doesn’t leave the taste of sadness in your mouth…it’s thematically dissonant and sonically captivating. 12 new songs of grunge-inflected alt rock and fearless artistry, levelled by Kidd’s infectious cinematic soundscapes and confessional songwriting. Direction Of Travel spills all sorts of emotions but it’s how Laura embraces and conquers them that truly makes this an album to remember. 5/5 ~ Mustafa Mirreh, The Flux Presents. For all the melancholic darkness of the music, the sense of hope is palpable. A truly magical [record], transporting you away to a different world. Yet again, Laura shows us that she stands firmly in a class of her own. The vocals throughout the album are nothing short of breathtaking and She Makes War has a wide range from the soaring vocals evident on opening track Drown Me Out and the electro tinged 5000 Miles to the sorrowful nature of the string laden Paper Thin and Stargazing. This blew me away, and it might do the same for you. One of my favorite recent listens period. A must. Each song has the strength and identity to stand alone but together they make an album that demands that it be listened to as a whole, in one sitting, without distraction. In an age of short attention spans and twitchy fingers hovering over the fast forward button, this is a rare and refreshing thing. 10/10 ~ Pavlis, Outline Online. Direction of Travel comes straight from the heart and is an interesting record from beginning to end. What could have been nothing but a Summer fling, has well and truly blossomed into a long term relationship with the music of She Makes War. Direction of Travel will surely have even the biggest commitaphobe ready to take that big step. ~ Christine Caruana, Victim Of Sound.